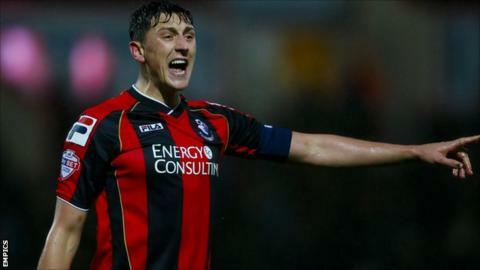 Bournemouth captain Tommy Elphick says his side are the team to fear as the race for the play-offs intensifies. The Cherries defeated Reading 3-1 on Tuesday to move within two points of the play-offs with five games left. The result was also their fifth win on the bounce and the defender believes Bournemouth can get into the top six. "You have to believe and you have got to dream, as if you don't have that then what have you got?" Elphick told BBC Radio Solent. Bournemouth, who were promoted from League One in the summer, have now won eight of their last 10 games and are the form team in the Championship. They are level on 61 points with Ipswich and Brighton, with Reading occupying sixth place on 63. When asked if Bournemouth were the team to fear in the Championship, Elphick replied: "Yes. The form table does not lie, the table does not lie. "It's eight wins in 10 and five in a row. It will count for nothing if we don't get there and we want to get there." When asked whether he believed they could win promotion to the Premier League, the former Brighton defender said: "I believe in this group and I believe in the manager and owner. "A lot of people don't believe because of the stigma attached to Bournemouth and that is wrong. "There are few heads turning now and few people are writing headlines about us being the team to fear and rightly so. "We felt we had to win (on Tuesday) to be in with a chance and we have done that. All of a sudden the gap does not seem so big. "It's exciting times and we need to back it up. We have a tricky game at Yeovil but we are full of a confidence and no team will fancy playing us. "Momentum and confidence plays a huge part as does playing in front of a full house. "I said it all along, momentum is hard to stop and we have it and need to keep riding it."